Black History Month is upon us as a reminder of the events during the Civil Rights Movement and the people in history of African Americans who made freedom possible and made great strides to better the world. On this week in 1956, history was changed as Autherine J. Lucy became the first black student to enroll at the University of Alabama. By today, she’d had her first few classes at the school, and faced tremendous harassment. She was born the youngest of 10 siblings in Shiloh, Alabama in 1929, and attended Selma University, later graduating with a bachelor’s in English from the all-black Miles College in 1952. After completing her education, she and her classmate/ activist Pollie Ann Myers, decided to enroll at the all-white University of Alabama grad school program. Both were accepted, but once university officials were provided with information that they were African Americans, the two students were barred from enrolling. 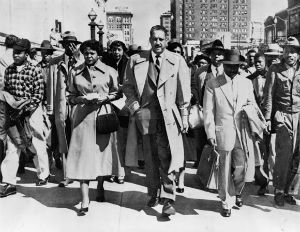 The women were represented by attorneys Thurgood Marshall and Arthur Shores, who petitioned for acceptance and admittance. However, it wasn’t until the 1954 Brown v. Board of Education that Autherine would once again confront and challenge the university’s policies. In Feb. 1955, a federal judge ruled that the university must admit them. After the institution denied Myer’s admission on the basis of being pregnant out of wedlock, Autherine made the bold decision to attend by herself. Three days into classes, she was confronted by a group of students who were armed with rocks, eggs, and bricks, yelling racist comments and even threatening her life. The rioters were protesting her admission, leaving her to hide in the auditorium and eventually be escorted out of the building. Fortunately, she was unharmed, but later that evening she was suspended by the University Board of Trustees “for her protection.â€ Sadly, attorneys were unable to immediately reverse the expulsion, but several years later in 1988 it was overturned. In 1992, she proudly earned her MA in elementary education from the University of Alabama, which was extremely well deserved. Autherine Lucy will always be remembered for her bravery, persistence, strength, and ultimately achieving her lifetime goal. Follow updates on this series via social media using #BE28andGreat for the whole month of February.